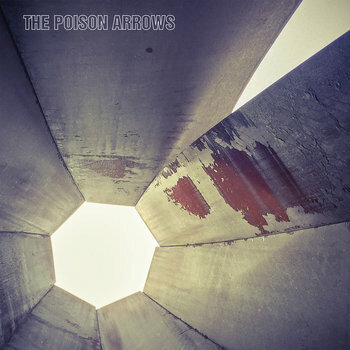 The Poison Arrows is a three-piece band from Chicago comprised of bassist Patrick Morris (ex Don Caballero), drummer Adam Reach, and guitarist, vocalist Justin Sinkovich (ex Atombombpocketknife, Thumbnail). After two LP’s and two EP’s on File 13 Records, and accompanying tours from 2007-2011, the band went on hiatus to recharge. All three of the members continued to play music. Adam made records and toured with Pink Avalanche. Justin and Patrick made an album as Acquaintances with Jered Gummere (The Ponys, Bare Mutants) Chris Wilson (Ted Leo and the Pharmacists, Titus Andronicus) and Steve Schmidt(Thumbnail). The Poison Arrows started to play shows again in 2015 with friends including Bardo Pond, Drive Like Jehu, godheadSilo, Milemarker, and Soulside. In the mean time they worked on their third album entitled ‘No Known Note.’ The title is a phrase Patrick used in rehearsal to explain to his bandmates what he was was playing on two songs in the works. There are two songs on the album named No Known Note (Part I and Part II). For those familiar with The Poison Arrows, this album is similar to previous releases in several ways. For example, ‘No Known Note’ was written and recorded by playing together with very little individual composition outside of rehearsal, and very little conversation about arrangements and details during rehearsal. The basic tracks were recorded typically in only one or two takes. And like their last album ‘Newfound Resolutions,’ there are minimal EQ’s and effects on the instruments to maintain the original recording’s sound. The main difference from previous albums is there are almost no keyboards on ‘No Known Note.’ Justin had previously split his time equally between keyboard and guitar live and on recordings. The photos for the artwork and layout was provided by longtime friends and collaborators Alexis Fleisig (Girls Against Boys, Bellini, Obits, Soulside) and David Babbitt (Touch and Go Records) respectively.